Vinegar was discovered more than 10,000 years ago, and since then it has found a variety of uses from household chores to cooking. It has even gained popularity in recent years as a handy tool in the laundry room because of its whitening and restorative powers. 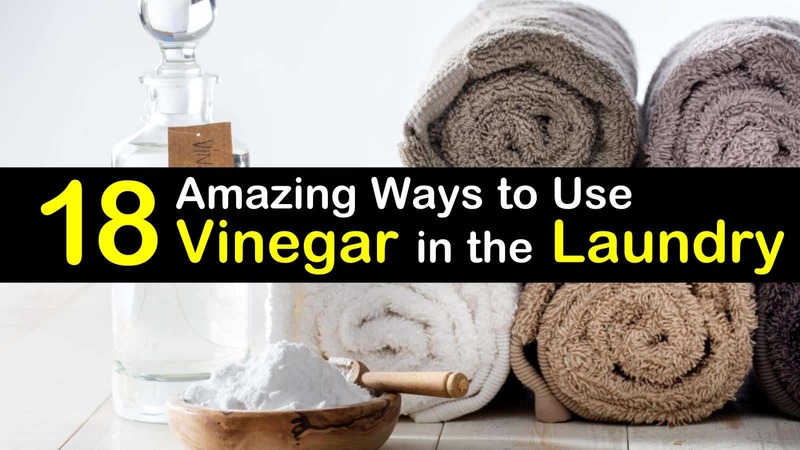 Here are some of the fantastic ways of using vinegar in laundry to do everything from eliminating sweat stains to reducing lint. Using inexpensive white distilled vinegar in your laundry will reduce odors while whitening, brightening, and softening your clothes without the harsh chemicals that can be toxic to you and your family. It is safe to use in both standard machines and high-efficiency machines and is more beneficial for septic tanks and the environment than other cleaning products used to get your clothes clean. All vinegar contains acetic acid that can be used to brighten, whiten, and deodorize your clothes. When using vinegar in the laundry, it’s best to use distilled white vinegar, rather than apple cider vinegar, because it doesn’t contain tannins that can result in stains, plus it will cost you less. If you only have cider vinegar, be sure to use less and dilute it with water before adding it to your laundry. The acetic acid contained in distilled white vinegar is exceptionally mild and won’t harm your fabrics but is strong enough to dissolve the residue that is often left behind by soaps and detergent. To get brighter and clearer clothes, you can add one-half cup vinegar to the final rinse. Merely add the vinegar at the start of the rinse cycle or pour it into the fabric softener dispenser. If you find that your whites look a little grey and dingy these days, brighten them up again by using vinegar. Soaking clothes in vinegar will get dirty dish towels white and stained white socks white again. Just add one cup distilled vinegar to a large pot of water and heat until it starts to boil. Once the water begins to boil, remove the pan from the heat, and add your dingy items to the vinegar. Allow them to soak overnight and then run them through their regular wash cycle. When you leave wet clothes in the washer or wet towels in the hamper can lead to mildew growing in the fabric and result in a moldy smell that permeates your laundry. Using vinegar in the wash can help you banish this unpleasant smell. To get your laundry smelling fresh again, fill the washing machine with hot water and add two cups of distilled vinegar. Run a complete wash cycle, then add detergent and run a second cycle. This technique works great when dealing with small amounts of mold and sour smells. Not only are commercial fabric softeners harmful to the environment, but they can also interfere with the fire-retardant qualities of children’s clothing. If you dislike the thought of using a heavily scented fabric softener in your laundry, but still want to enjoy softer clothes, you can use white distilled vinegar in your wash, which acts as a natural softener. For me, white vinegar is also the best baby laundry detergent. Plus, it won’t leave any residue on your laundry like a commercial fabric softener. Just add one cup to the final rinse cycle to soften all your laundry. You can also add a few drops of your favorite essential oil if you enjoy a light scent. No one likes the idea of pulling their clothes from the dryer only to discover they are covered in lint or pet hair. When you add half a cup of distilled white vinegar to the rinse cycle, you can prevent the pesky pet hair and lint from clinging to your clothes. You can also do this if you accidentally washed your dark clothing with a lint-producing towel. The added vinegar will get rid of the excessive lint. To remove perspiration odor and underarm deodorant stains from your washable clothing, spray vinegar directly on the inside of the underarm areas before throwing it in the washing machine. Allow the undiluted distilled white vinegar ten minutes to work before starting the washing machine. After washing, if the fabric feels stiff, you can use a soft-bristled brush to break up the residue. The vinegar works to cut through the extra deodorant on clothing that results in underarm yellowing. If you have kids, you know that they grow quickly, leaving you to take out the pant hems to accommodate their rapid growth. Unfortunately, this often means the pants are left with an unsightly mark where the old hem used to be. To get rid of the tiny holes that are visible along the hemline or seam, you can use a vinegar moistened white cloth to remove these. Just place it under the fabric and press the garment with an iron set to the correct temperature setting for the kind of material you’re working with. Use a pressing cloth on top of the fabric to help prevent scorching. If you’re tired of your black clothing looking dull, you can add vinegar to the final rinse cycle to keep the fabric from fading. Adding a half, a cup of distilled white vinegar to the last rinse cycle when washing black clothes will help to remove the detergent residue that makes washable dark clothing look dull. If you smoke or you’re around someone who does, your clothing probably tends to reek of cigarette smoke. Eliminate this undesirable odor from your washable clothes by adding a half a cup of white vinegar to the wash cycle. To remove smoke odors from dry clean only clothing or decorative furnishings like pillow and drapes, you can fill your bathtub with scalding water and add a cup of vinegar. Then hang the clothes or fabric above the tub and shut the door. Doing this will allow the steam to penetrate the fibers and eliminate the odor. Cleaning a washing machine with vinegar results in a cleaner load of laundry, every time. Same goes when you use a cup of white vinegar to clean your dishwasher. For the washing machine, each time you do laundry, soap scum and mineral deposits remain behind resulting in a buildup that can restrict the flow of water. To remove the soap scum and clean the hoses, add two cups of vinegar to an empty washer and run a complete wash cycle using hot water. Do this process about four times a year to keep your washing machine running at its best. To clean the fabric softener and automatic detergent dispenser, pour white vinegar in the dispensers to rid it of any detergent and fabric softener residue that may be limiting its performance. Your iron’s steam vents and spray nozzle can quickly get clogged from mineral deposits. To remove these deposits and clean the iron, fill the water reservoir with equal parts vinegar and distilled water. Set the iron up and allow it to steam for five minutes. Let the iron cool, then rinse the water chamber with distilled water. Refill the iron with distilled water and shake water through the vents onto an old cloth. Finally, to eliminate any remaining residue, iron an old rag for several minutes. If your iron has scorch marks, you can quickly remove them with salt and vinegar. Mix equal parts white distilled vinegar and salt together to form a thick paste. Rub the paste on the iron’s faceplate, then wipe down with a cloth that is dampened with white distilled vinegar. When you launder your colored clothes, there is always the possibility that the color will run and bleed into the rest of the clothes in the wash.
You can eliminate colors from running by adding vinegar to the cold water before adding the detergent and clothes to the machine. A little bit of vinegar can help remove tar and other sticky substances from your clothes. All you need to do is pour some white distilled vinegar over the stain and allow to sit for several minutes. Then, merely launder the garment as usual. As your towels age, their ability to absorb liquids declines. This is usually because we use more laundry detergent than needed and because of a buildup of fabric softener residue. To reverse this problem, you’ll need to wash your microfiber towels twice, skipping the laundry detergent with both loads. The first time, run the towels through a regular wash cycle with hot water and one cup of white distilled vinegar. Then, run them through another wash cycle using hot water and a half a cup of baking soda. This process will strip the detergent and softener residue from the towel fibers increasing their absorbency. To remove wine stains from your favorite shirt or tablecloth, heat two cups of white vinegar in a large pot until almost boiling. Take the stained garment and stretch the fabric, stained-side down, over a bowl. Carefully pour half of the vinegar, about one cup, over the stain. It is the same procedure you can use for removing bleach stains from any clothes. Rinse the garment under cold water then place the fabric in the remaining cup of hot vinegar for 20 minutes. Rinse again with cold water and immediately wash as usual. You can disinfect fabric without resorting to using bleach, which is a harsh chemical that can irritate your lungs and skin. This makes vinegar the perfect household laundry disinfectant for washing pillows. Add one and a half cups of vinegar to the wash cycle along with your detergent. Use the hottest water recommended for the fabric type. If you use homemade laundry detergent to wash your clothes, don’t add the vinegar until the rinse cycle and let it soak for 20 minutes. When you first buy a new pair of jeans, they can feel stiff. You can give your brand-new jeans the buttery, lived-in feel without ruining them. Wash jeans in a cold cycle with nothing more than two cups white vinegar. Before the rinse cycle starts, stop the machine and let them soak for 20 minutes, then start the washing machine back up and finish the wash.
Vinegar has become an all-around miracle product that can be used to clean everything from the bathtub to your laundry effectively. Once you learn the right way of using vinegar in the laundry, you can save money, instead of wasting it on the expensive commercial products that contain harsh chemicals. Knowing how much vinegar in laundry will depend on what your goal is for your laundry. 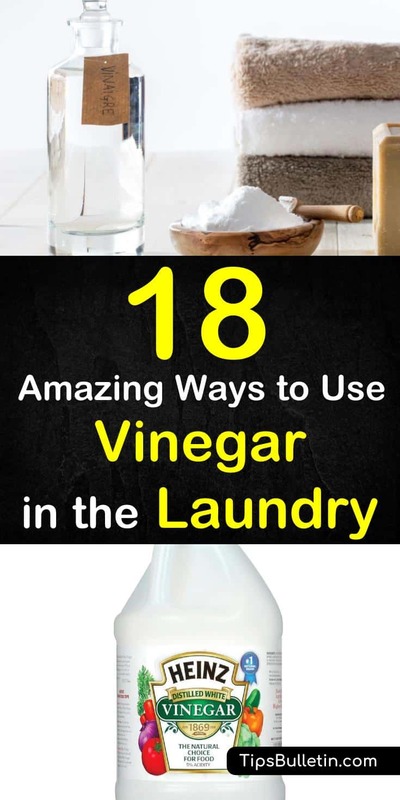 We hope you enjoyed learning the many different ways of using vinegar in the laundry. If you found the information in the article useful, please don’t hesitate to share it with all your family and friends.